Location: Set in own grounds south-east of Mold and reached along short drive. The dating of the original house, built by the Lloyd family, is uncertain but likely to be mid C16 from the evidence of the fenestration on the north-east side and from 1540's datestones. The principal phase of the present H-plan house is early C17 (dates of c1625 and c1640 have been suggested). It is one of a group of major gentry houses of the period in the Mold area. In later C19 a rear service range was added between the wings at the back and at the same time the interior was partly remodelled all to the designs of Thomas Jones of Chester. In the 1969-70 restoration by Robert Heaton the screen was recovered and the staircase was moved again. The early history of the house has a confusing piece of evidence in a surviving carved overmantel in the present dining room. This is dated 1546 and inscribed with the initials 'ELl' and 'MLl' possibly commemorating Edward Lloyd's marriage or his building of the first house. However, the costume of the four virtues flanking the main panels of the overmantel is Elizabethan and the Royal Arms to the centre are those of James I. The 1546 date together with that of 1540 over the main entrance must have some relationship to the house especially as there is evidence in the fabric to suggest mid C16 origins. It is therefore possible that the house was first built in 1540 and that when it was enlarged in the early C17 the then Edward Lloyd wanted to commemorate his namesake grandfather; the most important dates to mark would be that of the building (main entrance) and that of his marriage in 1546 (overmantel). 3-storeys built of local sandstone ashlar, roughly dressed, with high plinth and roofed with large Welsh slates. 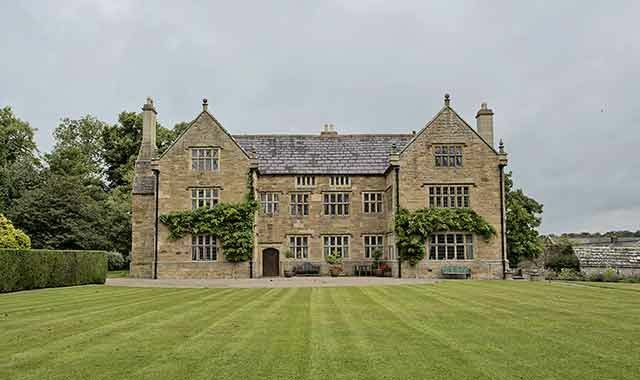 It is distinctive for the completeness of its early C17 front with projecting wings flanking a recessed central block, offset entrance in the medieval hall-house manner and large mullion and transom windows all with hoodmoulds. There is a mixture of diamond and lozenge pattern leaded glazing. The windows are mostly 3-light, although 4-light to the gable end of the left-hand wing and larger still to the main rooms to the right, the parlour on the ground floor and the great chamber above with 5- and 6-light windows respectively. The 3rd floor (attic) over the hall is unusual for its shallow windows under the eaves, front and back, instead of the more typical gabled dormers; the result is a more elegant design but with the windows almost at floor level. Segmental arched head to main entrance with boarded door; dated 1540 and inscribed 'ELl MLl' as discussed above. The gable ends of the wings have large kneelers and conoid finials plus diagonally-set apex finials. The broad chimney breasts are placed laterally at both ends with similar kneelers but the original stacks have been separately replaced, in yellow and blue brick; stone stack to rear. The east side of the parlour wing has an inserted doorway to the left of the lateral chimney but to the right there survives the evidence of the C16 house; the masonry here is older in character and has different quoins and the fenestration is stylistically C16 with round-headed lights, Tudor hoodmoulds and carved spandrels (weathered). Similar windows survive on the rear gable end of this wing. Single-storey and attic extension beyond the gable ends flank a small stone-walled yard, paved with Penrhyn slates (one of the Lloyds was agent to the Penrhyn Estate in mid C19); this is closed on north side by a single storey outbuilding including stables; partly converted to a garage. The plan-form of the sub-medieval house is largely retained with entrance being onto a cross-passage retaining, to the right, the fine post and panel screen. Its horizontal members create a square-panelled appearance and at the centre is a good example of a depressed, double-ogee doorhead over the entrance to the hall; the 1st floor has been slightly lowered obscuring the head-beam at the front. The hall itself is panelled with some reused C16 and C17 wainscotting and the beams have been encased in the C19 remodelling; the fireplace retains a fine overmantel with Ionic pilasters flanking the arms of Lloyd of Pentrehobyn and Morgan of Gwylgre fron which family Margaret married Edward Lloyd in early C17. The parlour, beyond the dais end, retains an early C17 stone fireplace, lively animal frieze depicting the 'chase' and more reused panelling. Above this the great chamber has a similar fireplace, a more simpler Jacobean frieze and apparently in-situ panelling together with some simple plaster detail around the wells of the ceiling. On the other side of the screens passage the service end was transformed in the C19 into a dining-room; this has stop-chamfered beams, panelled dado, a frieze copied from that in the parlour and the reused overmantel described above. At the same time the staircase was moved and it has been moved again more recently but retains its C17 turned balusters and dog-leg form. It also has a most unusually carved (Hubbard describes it as 'barbaric') newel post and finial which is said to be a reused bread trough and to have come from Glanhafon Fawr, Llanfynog, Montgomeryshire and to have been a part of a piece of furniture in the form of a buffet. Various panelled doors, mostly 6-panel upstairs. The attic retains the original C17 roof structure with cambered tie beams, collars and queen struts to the four central bays over the hall and passage and arched braced trusses to the wings. Listed Grade I as a major North Wales country house retaining the design and character of the original sub-medieval building. Linked to the east side of Pentrehobyn House by a short screen wall. Situated on sloping site to north-east of Pentrehobyn house and closing one side of the former walled garden. Bordering the main garden and including the gated entrance from the main drive to the forecourt of the house. Situated to north-east of Pentrehobyn and immediately adjacent to the large barn. Located at the NE edge of the Community Council area, on the street- line on the E side of the Mold-Wrexham road. Situated facing each other across wide forecourt, linked by late C20 iron work railings. Disused N driveway to Leeswood Hall runs from lodges across meadow to S.
Spanning the River Terrig in parkland immediately south of the pair of Lodges flanking the former N Driveway to Leeswood Hall. Located on the W side of the main Mold-Nercwys road, slightly set back and at right angles with it.